-Fashion bonus points go to the young lady in front of me brave enough to show up in COMPLETE tracksuit/jogging outfit. Not only that…matching jogging outfit. Those of us in the Fire and Flames world, while big fans of jogging pants and jackets, are strict adherents to the rule of „one or the other,“ meaning if you are wearing jeans a track jacket is OK, and if you are wearing a real jacket then jogging pants are OK…but never both together (except for the occasional trip to the kiosk). -Minus points on the other hand to the young kid next to me in full „casual“ hooligan attire. Stone Island jacket, Lacoste shoes, plaid cap, and of course the hipbag across the chest in „szene typische“ style. It was too much too young. -Speaking of „hooligans,“ I also had the displeasure of having enough time to more closely study some German football fans, in the form of Hannover 96 fans. The stupidity, the bad music, the idiotic outfits, the growling chants…Im definitely not a fan of this football culture. -I think Sarazzin is right on one point. There is indeed such a thing as the integration resistant migrant. I know…as I realize further and further that I am one. 7 years in Germany, and the relationship of hatred towards my surroundings does nothing but grow. And that although I am an experienced migrant, having lived several year periods in several countries spread over three continents. In every case there was the immediate affinity to the anarchist/autonome scene, but there was always still some cultural „common points“ with „normal“ people. Im just not really finding them here to be honest. -“Displeasure“ is probably what the three Nazis I had the fortune of encountering at the „bahnhofsvorplatz“ experienced. 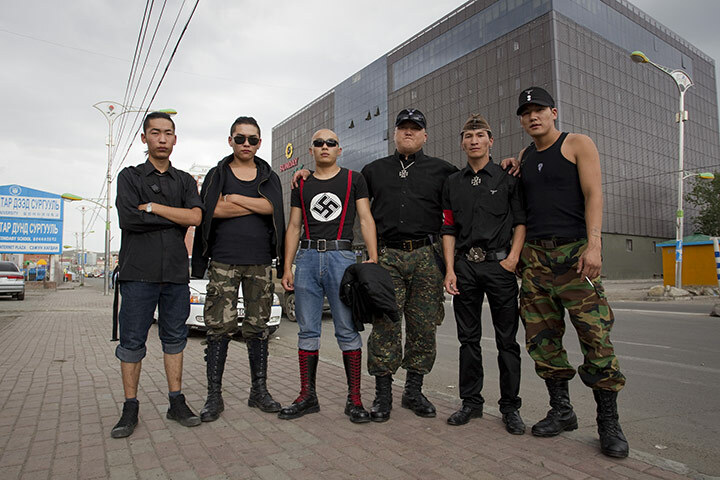 One of them was even so stupid as to be sporting a black/red/white flag as well as „reichkriegsfahne“ on his backpack. This was too much for my tolerance, so despite my injured status (cast on foot, so wearing flip flops!) I decided to exercise my civic duty and show some „zivilcourage,“ just like the cops taught us last week. 13.12 - Polizia Merda !